Having read many of Wood’s works, it comes as no surprise to me that after reading through Local, I found myself buried deep in thoughts of life: the chance that was our creation, continuation, and progression. We take hit after hit as human beings, from one another and circumstantial moments, and somehow always (near always) pull through to see the light of day tomorrow. As much as these experiences are the same between every person, they differ greatly in other aspects as well, such as: who they affect, what the damage is caused from, how those affected deal with the results, and what Brian Wood and Ryan Kelly focus on most; the locale. 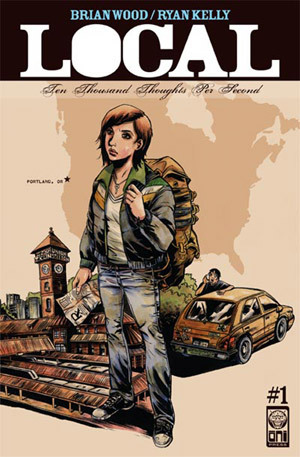 Megan McKeenan, a teen given too little boundaries, travels everywhere from Portland to New York in search of finding a place to call home. Through out these travels she encounters many different lovers, friends, jobs, personae and common life lessons such as not allowing strangers to roam your home, not allowing unknown people into your vehicle and that running isn’t always the best solution because eventually, those ghosts will come back and haunt you. This beautifully woven tale is fashioned similarly to Wood’s Demo with the exception of having a single character carry the entire way through. Whether Megan is a front runner or background character, she is always involved and sometimes that puts her in terrible situations. It is hard to find yourself while living on the run. Especially when that thing you are running from, is found within you. So no matter how you may wish to escape, resolve can only be found upon acceptance of who you are and where you come from. A lesson that one could say, Megan learned the hard way. As many hardcovers do, this edition of Local has plenty of goodies in the back pages for those of us who like to see some ‘behind the scenes’ glimpses into comics. Wood and Kelly each discuss their experiences with and personal play list’s for each issue. And after working my way through the book according to their recommendations, all I can say is that the musical accompaniment added a layer that at times will send chills through your bones. 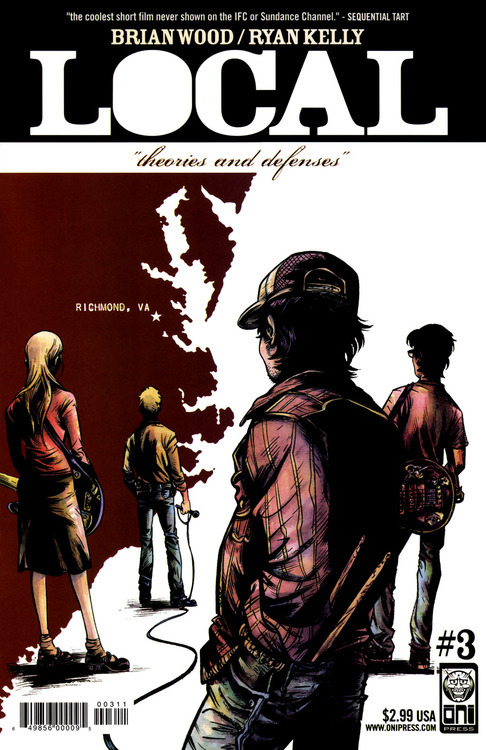 Local has many chapters that are told almost strictly through imagery, so the addition of the tunes adds an oomph to the atmosphere created within the panels. The tones drastically alter from city to city, as they do in real life, so expect a wide array of genres and paces throughout listening. 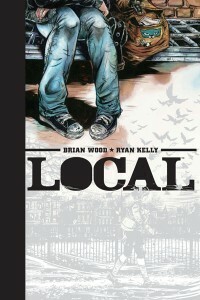 It is no secret that Brian Wood has a knack for making his reader care. It’s why these stories he presents us with always manage to win awards and change the perspectives of those who indulge in their poetically built notions. Proving time and again that emotionally charged stories built around obscure situations and eye-opening ideas are universal and relate able to nearly anyone who encounters them. These are the kinds of books you can hand to your teenage kid and grandma alike, expecting they will take something of value out of it. If you don’t buy it for the pristine and elegant art of Ryan Kelly – who by the way deserves an extra pat on the back for accurately portraying every single city, bar and destination within this comics bounds – or the addictive and all to real story laid out by Wood, then buy and read this for the simple fact that you will find at least a single moment of personal attachment and severe relation to either Megan, or one of the many folk she encounters. Simple stories that hit this close to home are few and far between in this action packed society. Do yourself the favour: Sit back, grab a cup of joe, relax and bask in the, at times gruesome, ecstasy of each locale. This is such a good book! It rates right up there with “Demo” as some of Wood’s finest work.